199999651 -Tracing the exchange of ideas between history’s key philosophers, The Great Conversation: A Historical Introduction to Philosophy, Seventh Edition, demonstrates that while constructing an argument or making a claim, one philosopher almost always has others in mind. It addresses the fundamental questions of human life: Who are we? What can we know? How should we live? and What sort of reality do we inhabit? 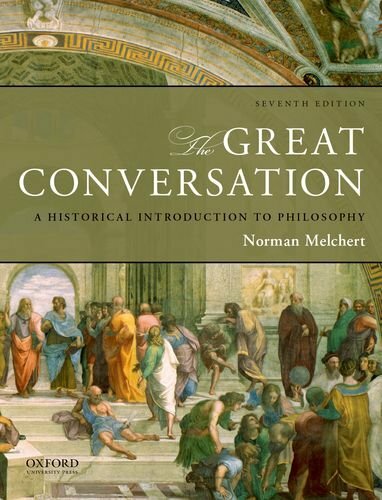 Author Norman Melchert provides a generous selection of excerpts from major philosophical works and makes them more easily understandable to students with his lucid and engaging explanations. Extensive cross-referencing shows students how philosophers respond appreciatively or critically to the thoughts of other philosophers. The text is enhanced by two types of exercises–“Basic Questions” and “For Further Thought”–and numerous illustrations.